Lessen the stress on the caregiver. 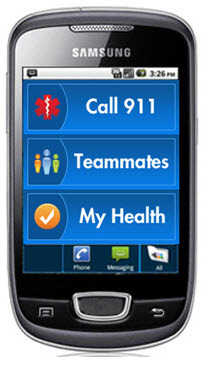 Most emergency response systems offer service in the home of the senior. The senior wears a pendant or device that offers some great perks, such as being water proof, easy to wear, etc. But it is often limited to the boundaries of the home, and must be within range of the base to work. My Health Phone is a fully-functional cell phone that works almost anywhere. As long as it has cell service, the senior can use it for emergency help. This means it can be used inside and outside the home, while the senior travels, when they are out with their friends, on the grocery store, etc. Of course an emergency response system is important, but it is also important to recognize that not all emergency situations allow a senior to call for help. This can be a major concern for caregivers. My Health Phone's software can be set up to make regular check-in contact. The caregiver and senior can determine the frequency and timing, as well as whether or not the check-in is made by phone, text, or email. If the senior does not respond to the check in, the caregiver will be alerted. Most seniors take a plethora of medications. My Health Phone's software can be set up to give the senior medication reminders. It can be customized to fit the needs of the senior and their medications, and can be set up to let the caregiver know their response to questions about medication so that the caregiver does not have to nag the senior about whether or not they took their meds. As part of the My Health Phone service plan, you are provided with complimentary access to Proximiti’s My Internet Lockbox service, which means that no matter where you are, you can gain access to important documents and information. This service allows you to store electronic copies of documents such as living wills, HIPAA releases and medical directives for ready access in emergencies. This makes travel easier, and insures that should an emergency arise, the important information emergency personnel need is available. One of the biggest perks for the caregiver, is that this safety device keeps them in the loop automatically, and makes it easy for seniors to let them know how they are doing, eliminating the need for nagging.